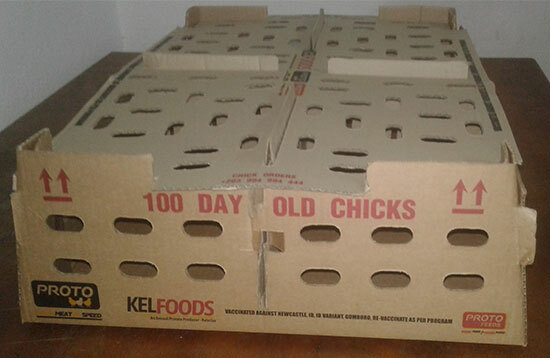 KELFOOD’s is the biggest supplier of day-old chicks in Malawi, selling our healthy chicks under the brand name PROTO Chicks. 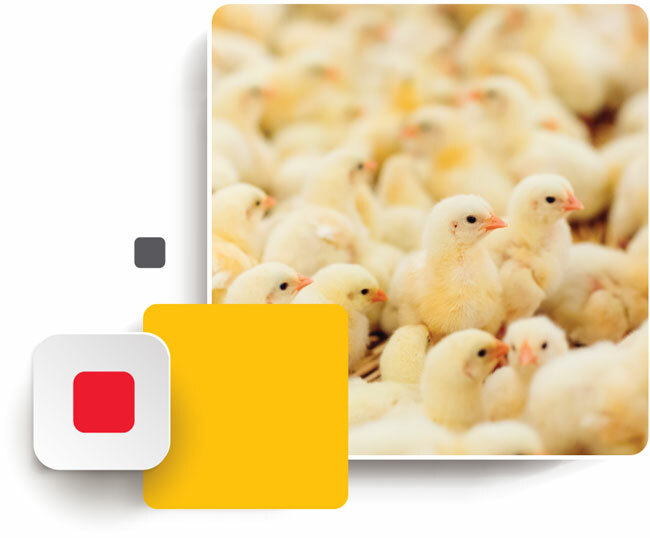 We sell up to 200 000 chicks per week, of which the majority is delivered direct to small scale farmers in Malawi. Our strategically placed breeder farms have the capacity to supply the demand in Malawi and the immediate regional markets. 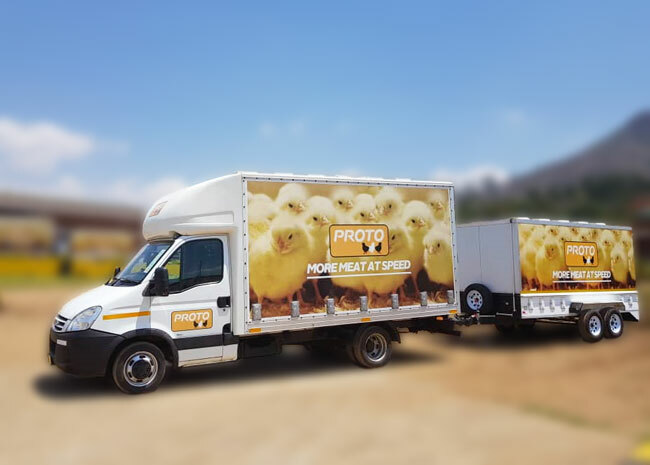 Our chicks are transported to the farmer or to KELFOOD’s outlets by a fleet of environmentally controlled vehicles and are boxed according to customer preference in a choice of 50 or 100 chicks per box. The packaging is designed to protect and keep the birds comfortable and safe in transit. Customers are encouraged to place orders 21 days in advance to ensure timeous delivery. In line with the KELFOOD’s vision to invest in the local economy by supporting local business, we also make our knowledge available to our customers via the PROTO demonstration farm and regular farmer’s days. 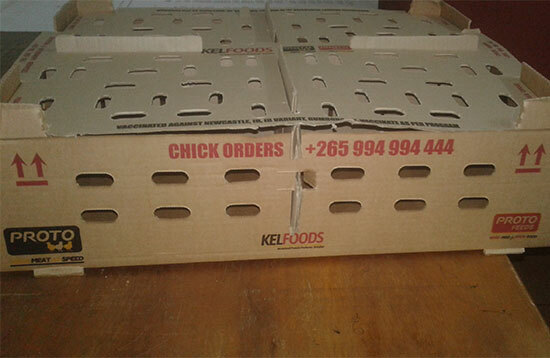 KELFOOD’s also supplies feed and equipment needed in poultry farming. Our easy to use feeding program for chicks is printed on the bags available at all the KELFOOD’s outlets. Help your birds to make your business profitable! Take good care of your chicks from day 1. Only a health chick will produce a good chicken. Chickens need a good environment to stay health and grow strong- dry well ventilated house, clean water, good sanitation and strict bio-security control. Give your chickens the best possible protection against diseases through correct use of drugs and vaccines. Ensure fast steady growth by giving the right feed at the right time. A healthy well fed chicken = good return on your investment. Clean & properly disinfect house, equipment and surroundings. Position curtains/surround so as to maintain correct temperature, good ventilation but at the same time avoid drafts. Aim for 40 chicks/sq meter for brooding. Spread litter material evenly may be softwood shavings or rice husk, minimum 10cms deep. Evenly space water founts and feeders in the brooding area. When it is cold pre-heat the brooding area to reach the correct temperature before receiving chicks. 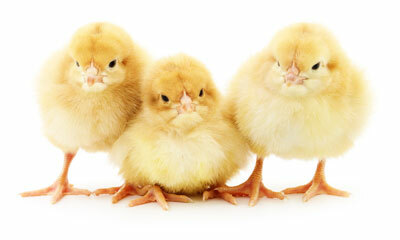 Chicks have enough air to breath. They are not exposed to too much cold or heat. Good ventilation and fresh air at the correct temperature for the age of the bird is essential. Avoid drafts by good management of the curtains. May be softwood shavings or rice husk. Litter should not become caked or too dusty. Use litter only for one cycle. 8-12 birds / sq meter up to 6 weeks. For best growth, 24-hours light during 1st day, 23 hours/day thereafter. Restrict access to farm as much as possible. Avoid vehicles to farm as much as possible. Avoid keeping other types of birds on the farm. The first few days are the most critical in a birds life so extra care and attention is required. Observe the chicks carefully and often – they will let you know how they feel by their behavior and if any changes need to be made. LOOK – at the way the birds behave. They should be evenly scattered throughout the brooding area. If they are huddled around the heater the room is too cold, if they are keeping far from the heater the heat is too much. LISTEN – to the sound they are making: low chirping = happy, loud noise = too hot & uncomfortable, no noise = cold or weak. SMELL – the air at floor level. You should be able to breathe comfortably. TEMPERATURE – the correct temperature during brooding is most important. Too cold means growth and final weight will be severely reduced. Too hot means chicks will be uncomfortable and will eat less. Clean water must be available to the birds at all times. Keep drinkers and feeders at the height of the birds back. Feed ad lib (keep enough feed in feeders at all times). All Day Old chicks will be vaccinated against Gumboro, IB variant and Newcastle Disease at the Hatchery. The next vaccination will ONLY be done on the 18th Day as an extra protection against Newcastle Disease. Take good care of your vaccine after collection from shop. Do not use chlorination water. Do not place diluted vaccine near heat source. Do not expose diluted vaccine to direct sunlight. Follow the proper procedure to make sure that all the birds have drunk the vaccines / water mix. The above are only guidelines and such they not a guarantee for success. There are other factors not dealt with above which also have an effect on tho! performance of the birds. However, following these recommendations will certainly help towards achieving a good results.